Festulolium is a perennial bunchgrass which has the combined traits of the Festuca and Lolium species. The expression of these traits varies by variety. There are approximately 227,000 seeds per pound. Festulolium is adapted to cool humid climates as well as less humid climates with supplemental irrigation. Festulolium does well on fertile soils with a pH of 5.5 to 7.0 but is not recommended for poorly drained soils or soils with poor fertility. Festulolium is easy to establish due to its rapid germination and seedling vigor. Seeding rates are 25 to 45 pounds per acre if seeded alone and 8 to 20 pounds if used in mixtures. Seeding depth is 1/4 inch. In general, 150 pounds of nitrogen per acre per year will be adequate to maintain a good stand of festulolium. The rule of thumb is to apply 1/3 of the nitrogen in the spring with the balance evenly applied after each harvest or grazing period. 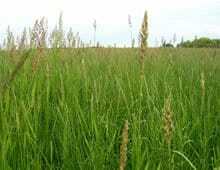 Festulolium performs best under a rotational grazing system and should be grazed down to 3 to 4 inches when plants reach a height of 10 to 12 inches. For silage or green chop, festulolium needs to be cut before seed heads emerge for optimum forage quality.